It's that time again! 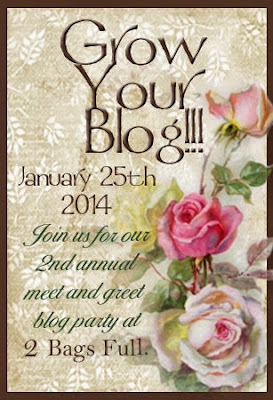 Dear Vicki over at 2 Bags Full is hosting yet another wonderful "Grow Your Blog" party! Because of her, my readership grew by leaps and bounds last year, so how could I NOT participate again? With nearly 600 blogs signed up, it's going to be incredible! Last year I marked the occasion with a tour of my Studio, but it really hasn't changed much since then (if you haven't visited before, Welcome! 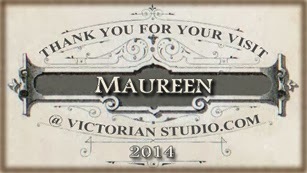 and click on the "Peruse The Studio" link at the top of the page if you do want to look around). What HAS changed recently is that I have learned how to add crafting videos to my very own YouTube Channel. 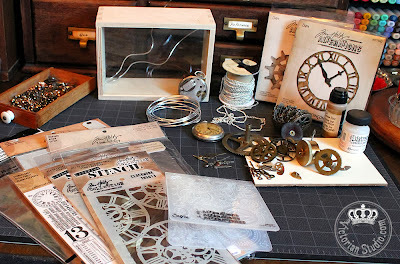 They make it so much easier to demonstrate my work with the supplies I used and I hope is more entertaining for you too. This week's project began after the tragic and sudden loss of a family member; all I could think about was how fleeting and precious Time is. 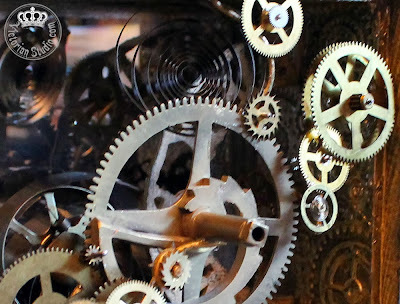 So an idea began to simmer and I dove into a Steampunk-like sculpture featuring some vintage clock and watch parts I had on hand. 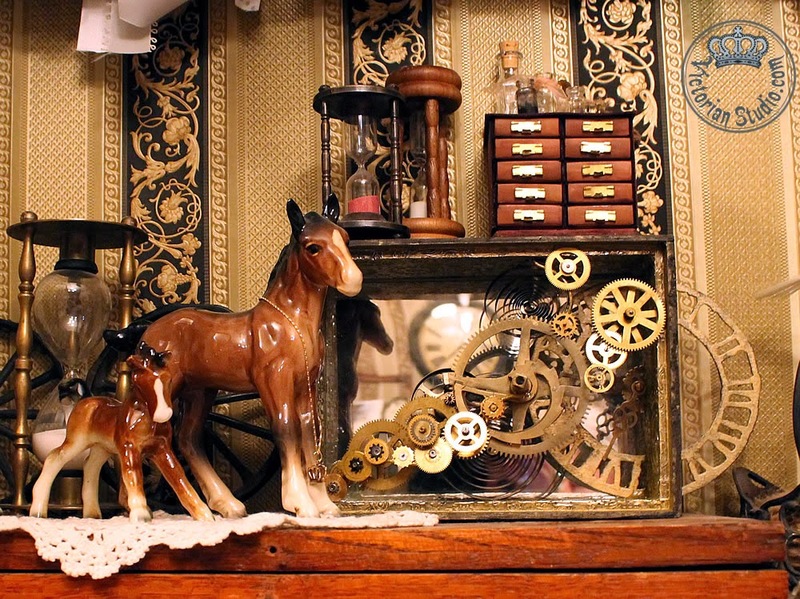 I began with a shadowbox I had picked up at Value Village a few weeks ago. 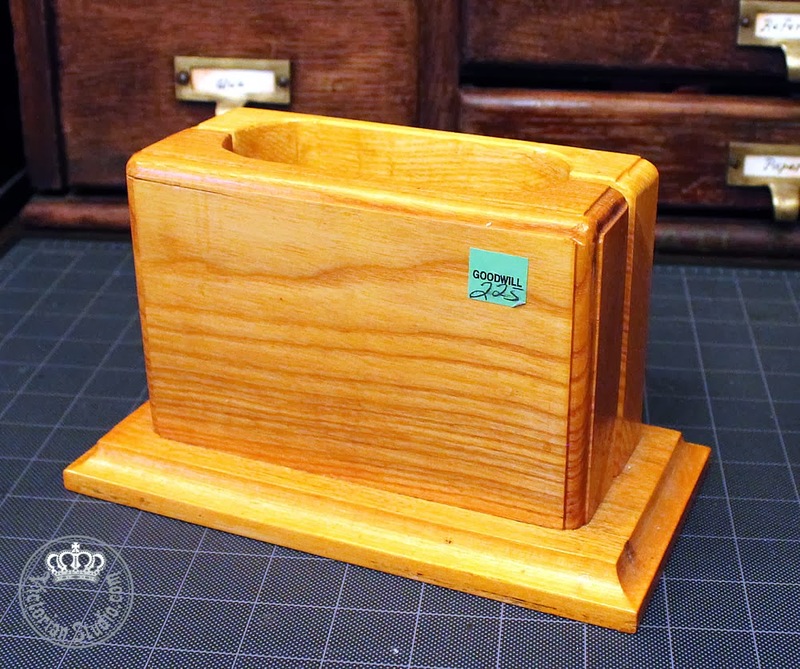 It has a glass front, removable back and is made of unfinished wood. I decided I wanted my sculpture to be tactile, so I flipped the box around, chucked the back panel and made the glass the back. This way, my sculpture could break free of the box itself. The inside was decorated using Ranger's Foil Tape Sheets after running them through my Cuttlebug with Tim Holtz' Alterations Gears embossing folder. The tape is backed with adhesive, so after laying it around the interior walls, I painted it to match the brass pieces I was going to use - first with Triangle Crafts Blackened Bronze paint and then Tim Holtz' Tarnished Brass Distress Stain. I popped off the stain's foam pad applicator and used a brush and my fingers to apply it, highlighting the pattern even more. 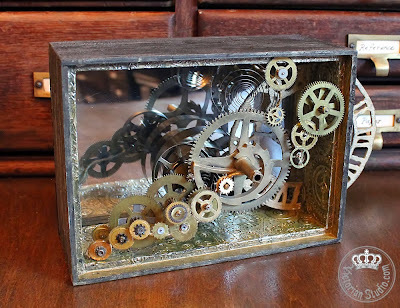 I needed a framework for the gears, so I first painted and then bent a long piece of aluminum wire in half, curved it into an interesting shape and secured it by running it through two holes in the box. Next I began the long process of attaching the clock and watch pieces with E6000 glue; just one at a time so they would set correctly. After they were in place, I snipped some areas of the armature away giving the piece the illusion of floating. 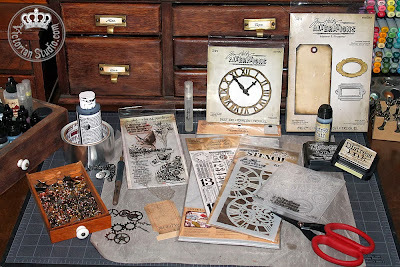 I'm sure Tim Holtz would cringe seeing me use his Tonic snips this way... but they worked like a charm! I added Tim's Weathered Clock on the right side; I cut two out of chipboard, painted them the same as the rest of the piece and sandwiched clear acetate in between so I could add a gear center and clock hands. I cut it in half, adhering one side inside the box and the other outside the box. 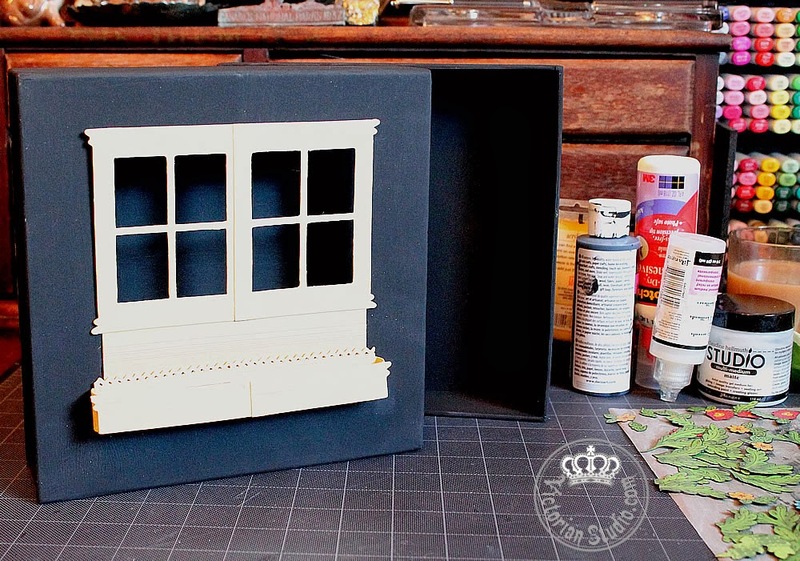 I finished off the outside with Ranger's Crackle Paint, then washed it with watered-down Blackened Bronze paint. I also used Tim's "Mirrored" sheet, cut to size over the glass back, adhered with ScorTape and backed with black cardstock. I like the way the mirror allows you to see the parts from behind as well. Thank you so much Vicki, for all your incredibly hard work putting together another extremely successful Grow Your Blog Party! Be sure to visit at least some of the nearly 600 blogs participating this year... 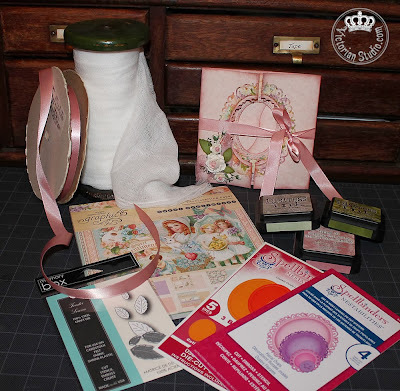 I'll just bet you find some amazing ideas and new bloggy friends along the way! 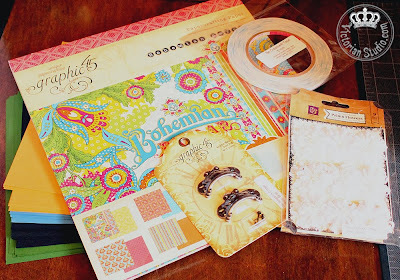 After creating my "Bohemian Bazaar" project for The Scrapbook Cottage here in Winnipeg, they gave me various 12 x 12 sheets of Graphic 45's new paper, "Couture Collection" and asked if I could use it to alter something from the thrift store. What is it? Honestly, I don't know! I did Google the shape, and it looks like it might be a home-made bagel cutter... a bagel is dropped in from the top then cut in two using the slots to guide the knife. But I am guessing here; it looked unused with no cut marks on it at all... so I could very well be wrong. Regardless, I picked it up because I liked the lines of the carving... reminding me of Art Nouveau, which is also the style of the Graphic 45 Couture Collection paper I was given. Now I just had to figure out what the heck I was going to create with it! I decided to make it into a stand one could place on a desk to hold a shopping list, pen, coupons and money before heading out to purchase the latest fashionable item (since the paper is all about fashion and style). I began by painting the box with black glossy Tremclad paint (chosen to ensure it coated the varnished finish) then decorated it with peacock-patterned paper on each side. I also added a chipboard pocket to the front and accented it with images from the collection. Since the peacock feathers were so lovely, I found real peacock feathers at Michael's to make a quill pen too. 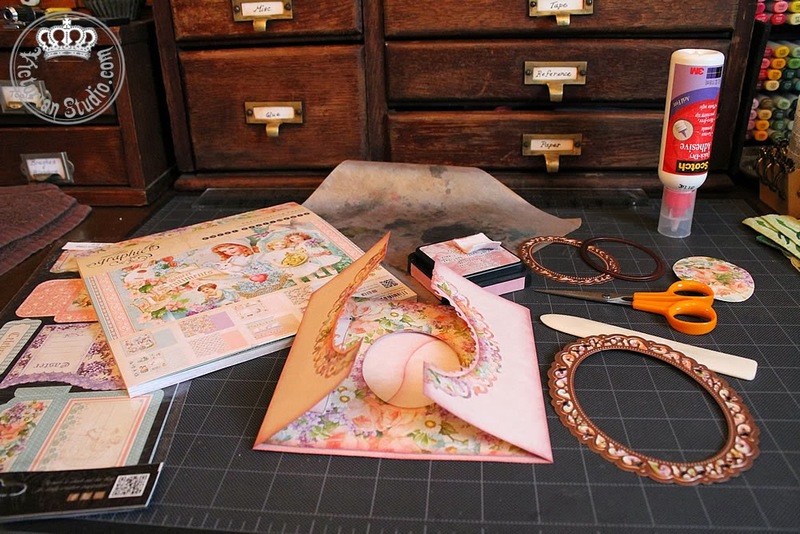 I cut and scored chipboard for the covers of the shopping list book and punched four holes at the top with my Cropadile. I also painted the edges of my book with black acrylic paint before adhering the cover papers and wrapping with turquoise ribbon to bind. I printed 50 pages on regular copy paper on my printer and cut them to size. 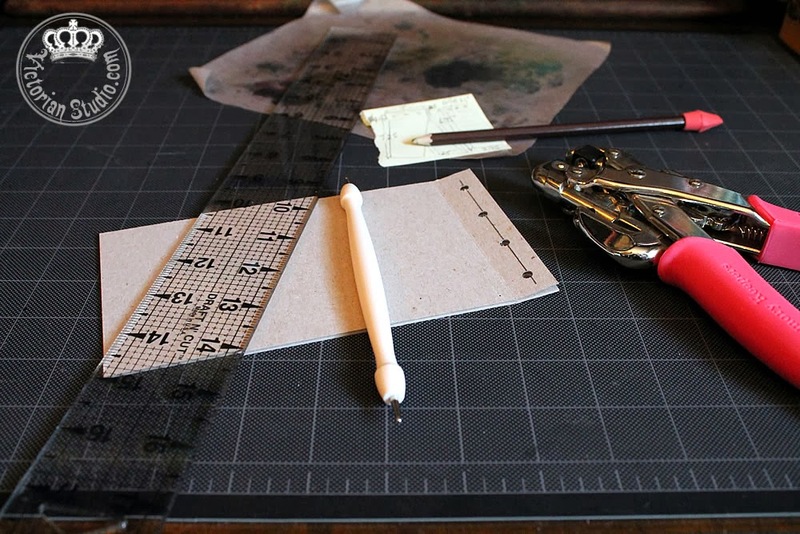 I just got this neat Tonic perforation tool - another suggestion from dear Anne at Anne's Paper Creations - and used it to perforate each page so it can be torn off neatly. 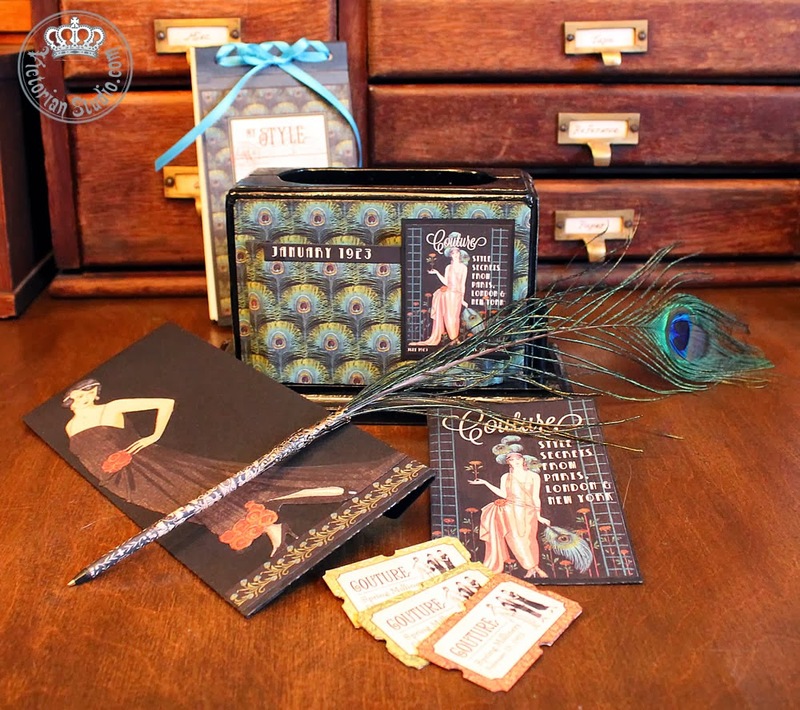 I also added two envelopes to the kit: a small coin-sized one holding three bookmarks, and a larger envelope to store money or coupons. The quill pen was a challenge. I spent a lot of time trying to come up with the best method on how to affix a pen to a real peacock feather. I eventually found that by slicing open the shaft and cleaning out the styrofoam-like interior, I was able to glue the cartridge of a stick pen inside it. I wrapped some Graphic 45 paper around and added two Bead's Landing jewelry findings to finish off the top. I cut down the pen's barrel and adhered it to the box stand with E6000 glue to store the quill. I've made another short video to show this project (I do hope you aren't getting tired of them!). Oh, and you'll notice I have been teaching myself how to use more features in iMovie - I've been having fun with that too! 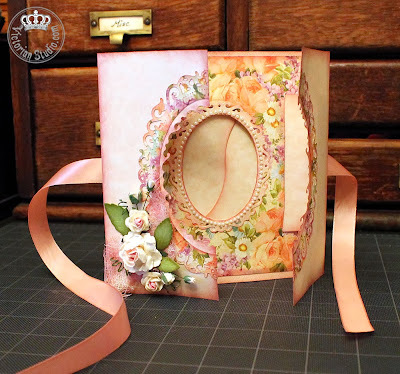 My mom's birthday is today, so I wanted to make something very special for her - a card style that I had never attempted before. 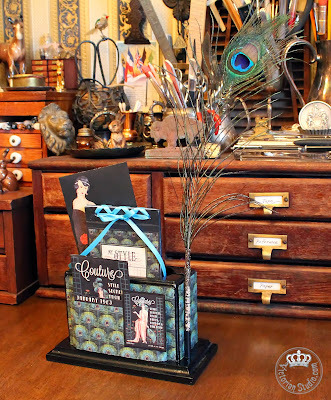 Again, Anne of Anne's Paper Creations came to the rescue with her Magic Lens YouTube video card tutorial. 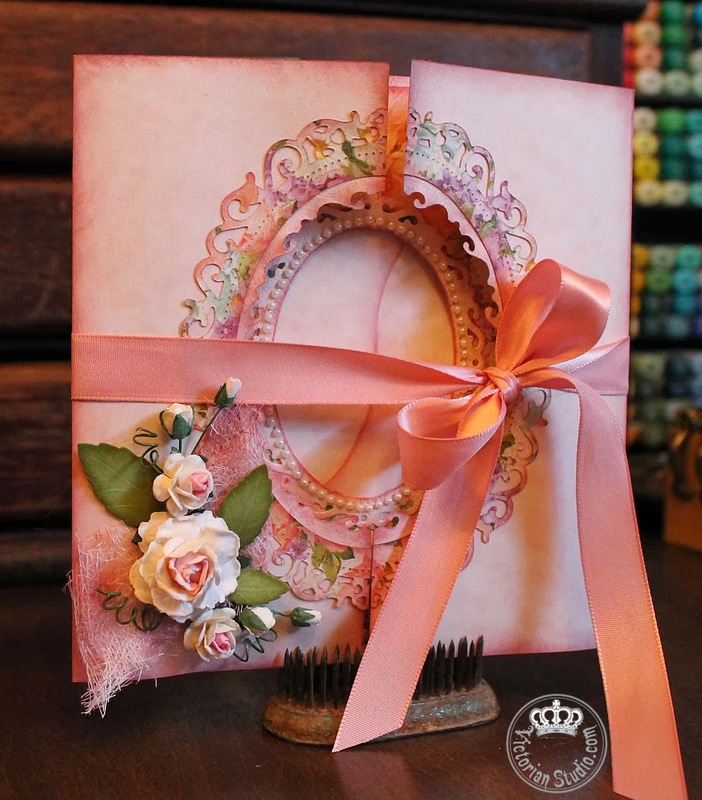 She used Spellbinder's Scalloped and Regular Hearts on her card; I chose the Spellbinder's Floral Ovals and Classic Ovals Large for my version. 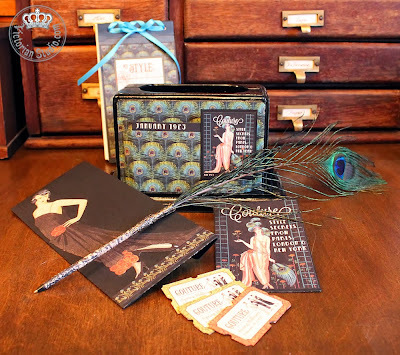 The cardstock paper is from Recollections (Michael's) inked with Tim Holtz' beautiful Victorian Velvet Distress Ink. 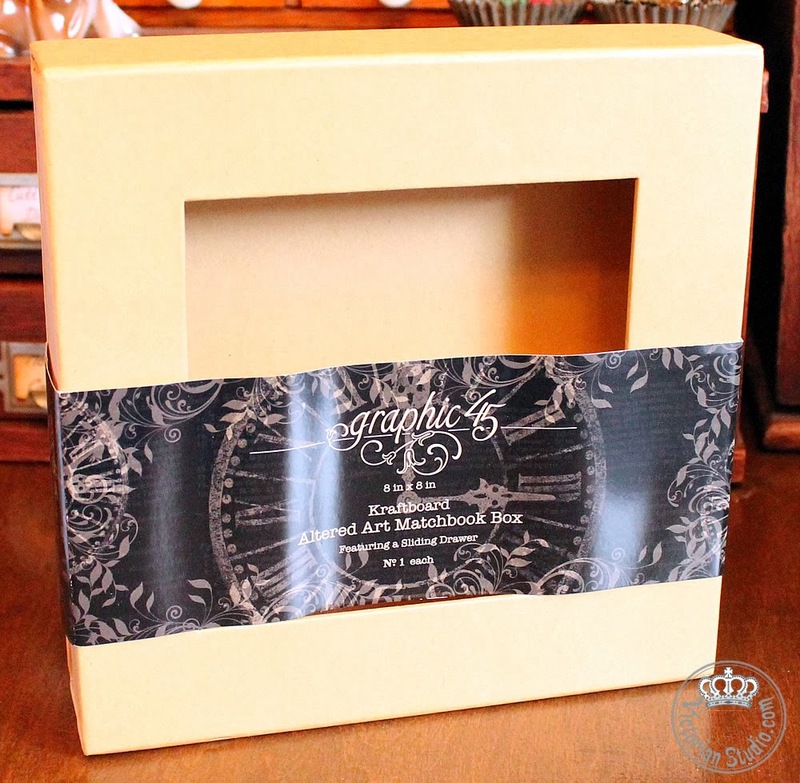 The patterned paper is Graphic 45's Sweet Sentiments (8 x 8 pad). Since my ovals were a completely different size and shape than the hearts in her tutorial, I had to rework the measurements and changed the way I mounted the interior paper - I cut slots rather than cut out each side. When I closed my iris, I accidentally tucked in the top and bottom of the iris in opposite directions (one inside and one outside the other side flaps) and it ended up making a cool "S" shape when it closed. So I inked the edges to make it stand out. I stamped the sentiment on patterned paper (the cutout from the front frame) so it would be revealed when the card is opened. I also adhered a ring of tiny pearls around the sentiment frame. Just a couple of fussy cuts dressed up the interior a bit; and instead of my usual habit of outlining the fussy cuts with my black Copic Multiliner, this time I wanted a softer look so I cut down a Q-Tip, ran it over my Victorian Velvet Distress Ink pad and coloured in the white cut edge of the flowers. The ribbon is run through piece of cardstock attached to the back of the card, so it can hold it shut with a bow (Anne used magnets for her closure). The roses on the front are from Wild Orchid Crafts and the leaves are by Memory Box (Tender Leaves die), which I coloured with Peeled Paint and Bundled Sage Distress inks. They are all bundled atop some cheesecloth dyed with Victorian Velvet Distress Ink and attached with Glossy Accents. 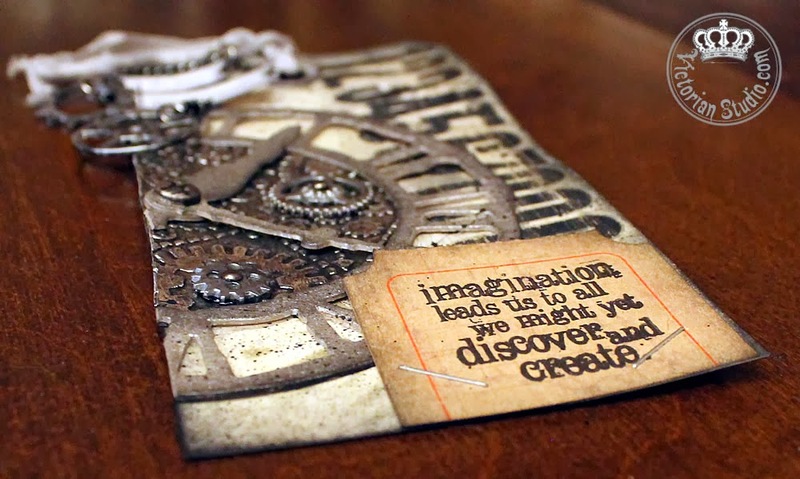 Here is a video showing the iris mechanism and how I made the envelope for this 6 x 6 card. Thank you again Anne, for another great inspirational video! 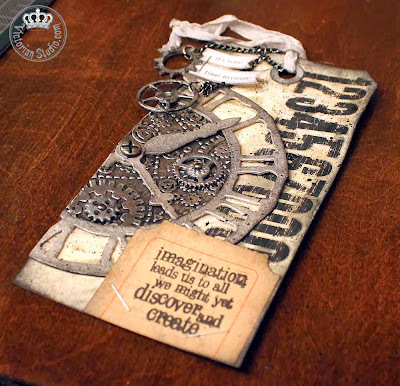 For many years, Tim Holtz has inspired his readers with monthly tutorials / challenges for creating beautiful tags... not only are they fun to make, it's a great way to try out some different techniques. Since it's a new year, I have decided to step out from the sidelines and finally participate. When I saw his January tag, I knew I could come up with something similar, as I already had many of the supplies he used... especially when I was thrilled to discover my order from Simon Says Stamp arrived on Friday with Tim's Weathered Clock die and matching Layering Stencil (how the heck did I know I would need these when I ordered them in mid-December???). 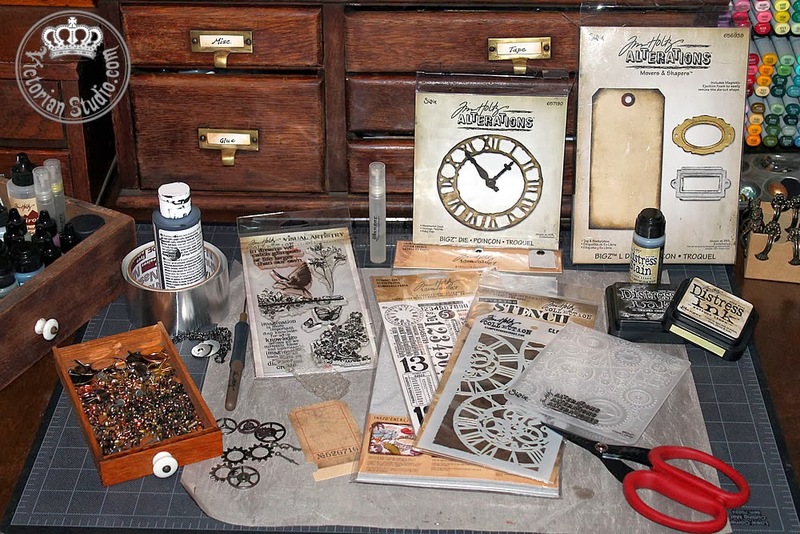 So instead of using a pocket watch die cut as he did, I cut out a chipboard clock face and hands - painting both with Distress Pewter Stain and Black Soot ink. It was very cool using Grungeboard for the first time; layering with some foil tape then running it through my Cuttlebug to emboss with his Sizzix Gears set. I used my Spellbinders die to cut it into a semi-circle and rubbed black paint into it to highlight the design. Gears were attached as Tim had, then I layered it under the Weathered Clock chipboard piece (adhering it with Glossy Accents) after securing the clock hands with a screwhead brad. 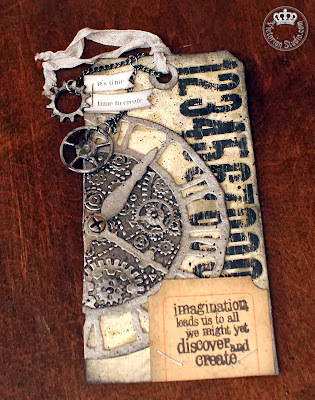 The tag itself was cut from Tim's "Tag and Bookplates" die - a new acquisition from The Scrapbook Cottage (using a Christmas gift certificate from hubby!). 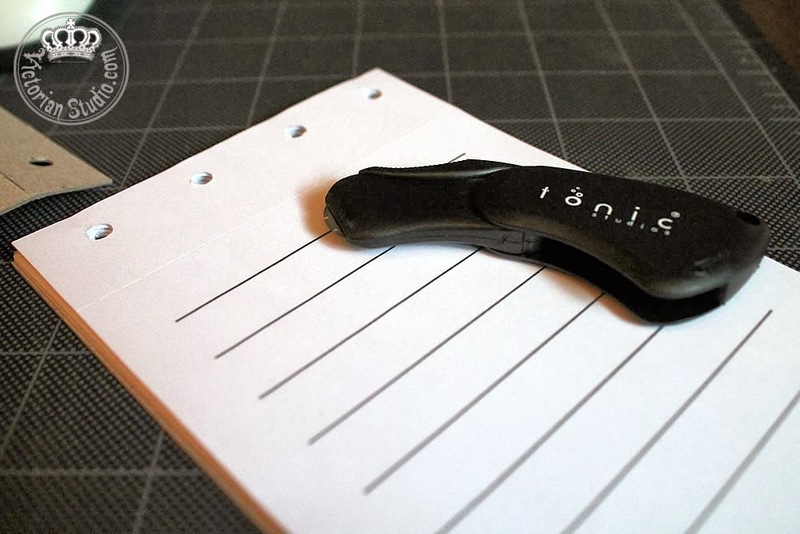 This will be perfect to have so I can cut tags from any colour cardstock I wish. 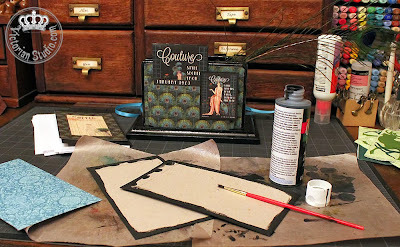 The background was created just as Tim had shown; using Distress Stains and inks and my new stencil. I also had the rub ons for the numbers; sanding them down and inking the edge of the tag with more Black Soot Distress Ink. A few splatters of black paint and the background was complete. I also had his "Journaling Tickets" (a gift from daughter!) and stamped it with just a portion of one of his sayings; using a Post-It Note to block off what I didn't want to show. 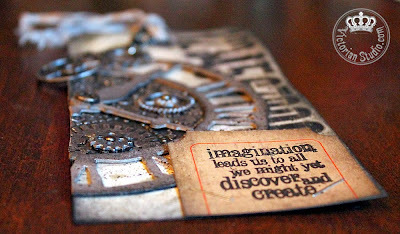 Some painted gears were added on a chain and the seam binding was crumpled up with my wet inky-black hands for a cool effect. I also added two sayings on small flags that reflect my feelings on this very first tag I have attempted in his series: "it's time" and "time to create". 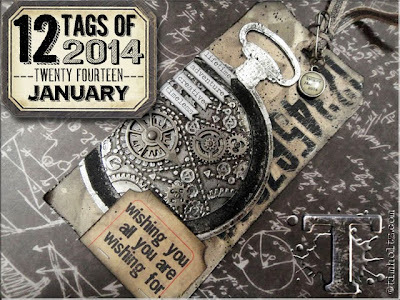 What a lot of fun - I do hope this will be the first of my trying all 12 tags in his series this year! Happy New Year! I hope everyone had a wonderful holiday; we sure did! How exciting! 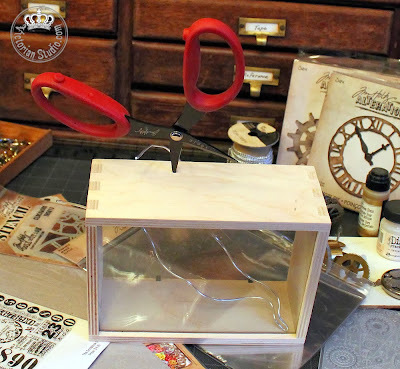 I have never altered one of these boxes before, so I wanted to make something really different... 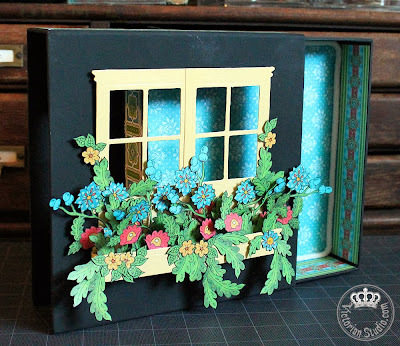 I painted the whole thing with black acrylics, got out my trusty Tim Holtz window dies again and using chipboard, cut out two windows and made a flower box underneath, painting with some Heidi Swapp paint I got years ago. 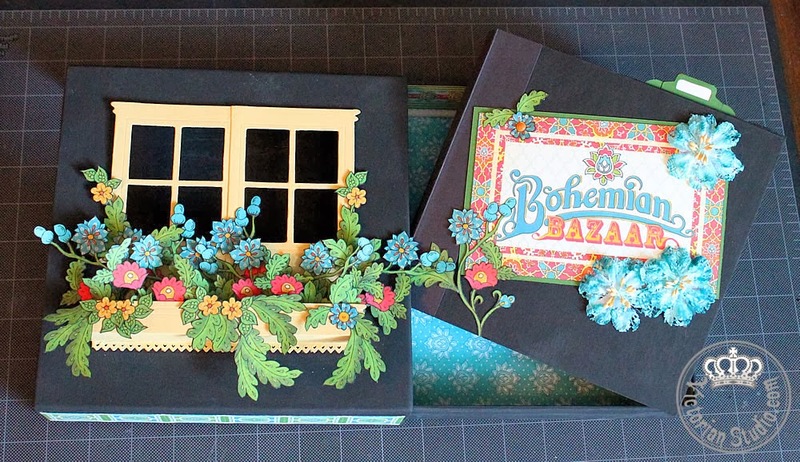 Using a few strips of black chipboard inside the window box, I was able to layer a whole bunch of fussy-cut flowers from the Bohemian Bazaar paper for a 3D effect. I used Claudine Hellmuth's Multi-Matte on each flower and leaf to strengthen them, after outlining with my black Copic marker. I used paper from the supplied pad and lined the inside of the box, finishing the inner edges with a length of soft cotton rope. I also attached the door pull before adhering the paper, to hide the brads. 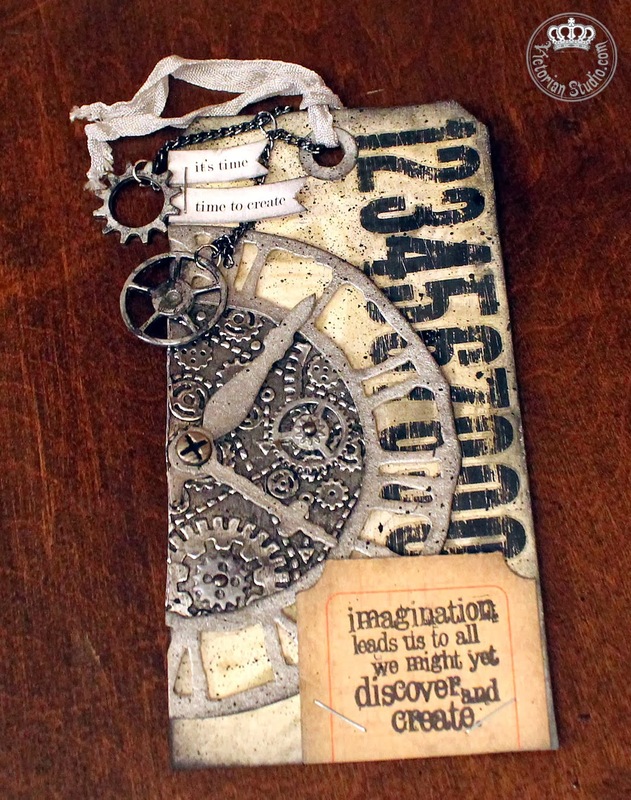 I wanted to include a small journal, so I followed Anne at Anne's Paper Creations instructions - the same ones I used for my Steampunk Journal (thank you dear Anne! ), this time making only three pages. Since I was supplied with 8.5 x 11 cardstock, I had to make the inner page folds simple... but it couldn't be too bulky as it still had to fit inside the box anyway. 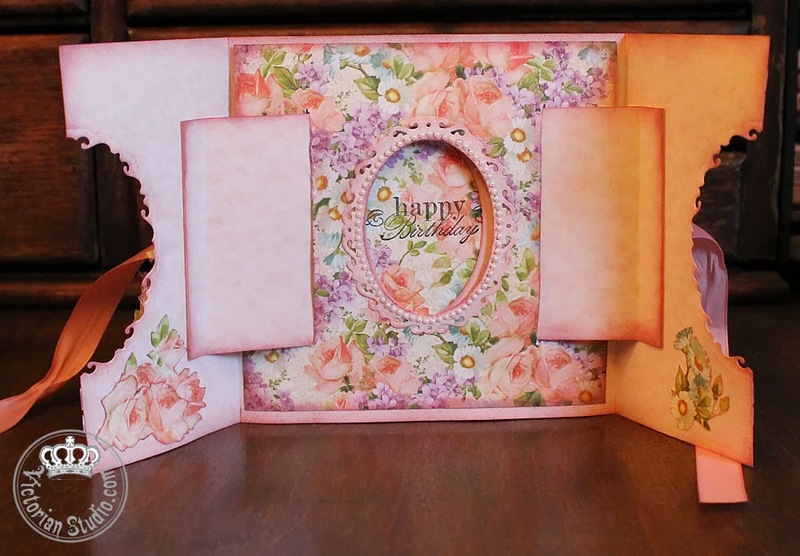 I added three lacy Prima Chantelle Medallion Flowers to the front of the journal, tinting with Copic # BG49 marker and Tim Holtz' Alcohol Blending Solution to wick the colour from the edges to the center. 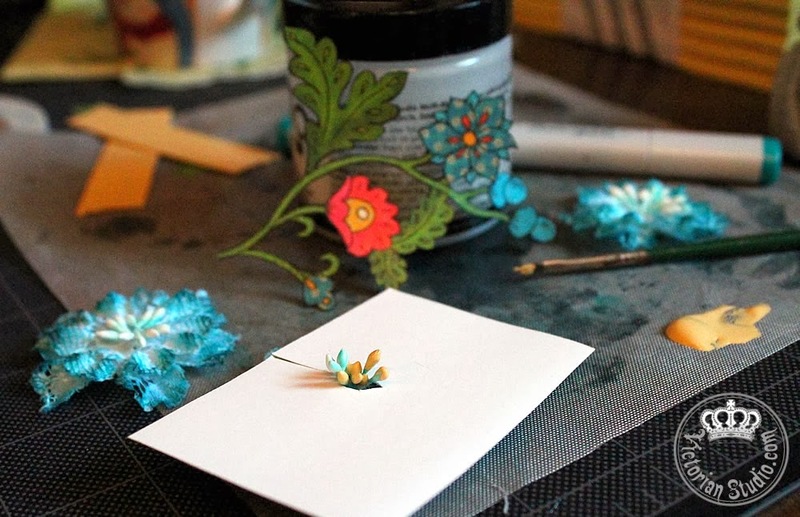 Since the stamens got tinged with blue too, I cut a protective collar to paint them with the Heidi Swapp paint. Instead of posting still photos of each page of the journal, I made a short video! 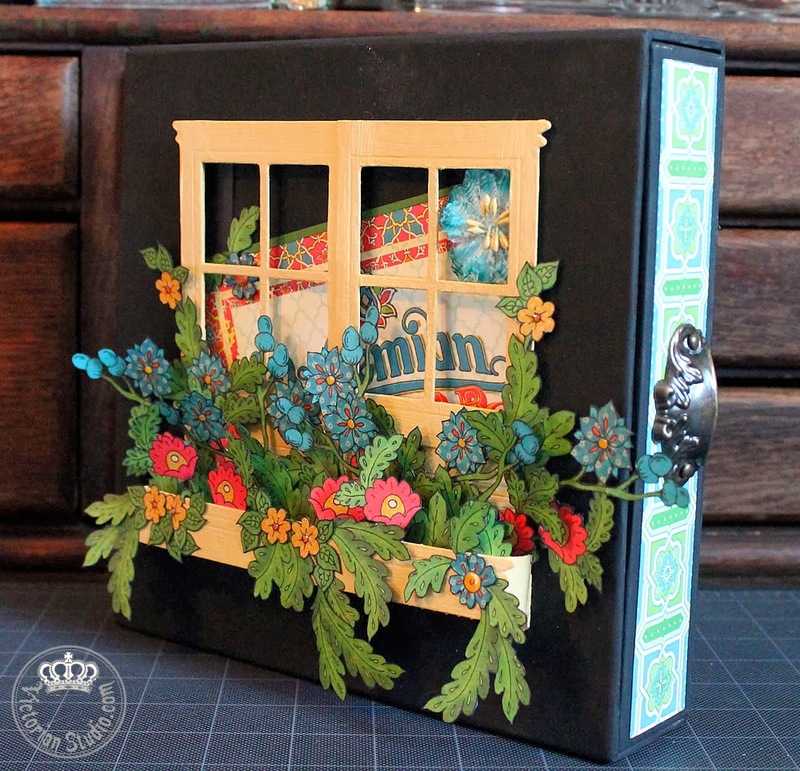 I hope you enjoyed seeing my latest project; tomorrow I will be bringing it to The Scrapbook Cottage - since this is my first assignment from them, I sure hope they like it!